RBTH presents a selection of views from leading Russian media, featuring discussion of the need for Russia to develop a coherent strategy on supporting the Donetsk and Luhansk “republics”, Poroshenko’s “humanitarian corridor” and the prospects for a ceasefire in eastern Ukraine, and the surprising rise of Dnipropetrovsk as a bastion of Ukrainian patriotism. 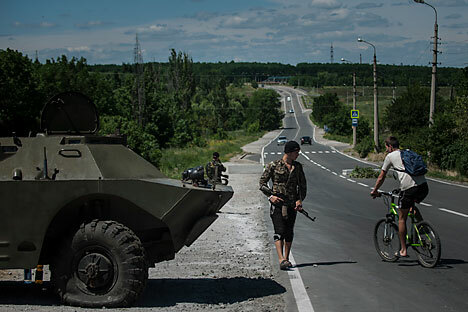 The Vedomosti newspaper says that Petro Poroshenko intends to create a so-called “humanitarian corridor” for the civilian population to leave the war zone in the Donbass. In addition, the publication reports that the government is planning to provide assistance to residents in terms of transport, medicines, food and water. However, Mr. Lavrov also considers that a peace process is not being implemented, and the fighting continues and “is even intensifying.” Lavrov called “the cessation of all military operations against the protesters” the key to de-escalating the situation in eastern Ukraine, the newspaper writes. According to Vedomosti, Kiev is demanding that the shooting from the opposite side stop first. In its article, Expert notes the need for a strategic plan to support the so-called Donetsk and Luhansk “people’s republics”. The publication says that the pause that Russia has taken publicly in relation to the situation in the region, can be interpreted as a gesture of goodwill towards the new president of Ukraine, Petro Poroshenko. For Russia it is important to stabilize the situation after the takeover of Crimea, and the emergence of new tensions clearly does not help, writes Expert. “It is necessary already today to start building new relationships with Luhansk and Donetsk, both in terms of humanitarian and possibly military aid, as well as in terms of joint economic and integration projects,” emphasizes the publication. The most important task, according to Expert, is to preserve and support the existing pro-Russian sentiments of the residents of the republics and to gain loyalty of the doubting sections of the population through economic stabilization and the development of partnership programs. Expert tells its readers that Russia should intensify its efforts in the delivery of humanitarian aid to the southeast of Ukraine. Such activity, the newspaper notes, should be part of a larger policy. The central task in supporting the Donetsk and Luhansk Republics would be to create a strategic plan for the development of the regions, and “this needs to be addressed today, without waiting for an escalation of the military conflict, the outcomes of diplomatic negotiations or a general Ukrainian economic crisis,” sums up Expert. Gazeta.ru tells its readers that during the political crisis in Ukraine, Dnipropetrovsk, unexpectedly for many Ukrainians, became the most patriotically-minded city in the country. A couple of weeks after the appointment of oligarch Igor Kolomoisky as the governor of the Dnipropetrovsk Region, “the region turned into a bastion of stability, and patriotic symbols for the locals became an almost mandatory accessory,” the newspaper writes. Gazeta.ru reports that many residents of Dnipropetrovsk have noticed an unprecedented unity. Dnepropetrovsk residents themselves, the newspaper notes, say that the decisive role here was played by the government and soccer fans “who at first started promoting patriotism, and secondly, started to sing songs in Ukrainian at the stadiums.” However, just as in Donetsk today it is dangerous for locals to show their pro-Ukrainian feelings, emphasizes Gazeta.ru, in Dnipropetrovsk it is dangerous to maintain a pro-Russian position. In addition, according to the publication, the influence of Dnipropetrovsk on Ukrainian regional policy has grown rapidly in recent times.